This gentle cleanser washes away impurities without drying, irritating or causing redness. Cucumber hydrates and soothes. Watercress, rich in antioxidants, helps protect skin from free radical damage. Love this cleanser so much! It removes all my makeup and leaves my face feeling clean and soft. It is so gentle and nourishing, and the best part is it's all natural, no funky ingredients. The last time I purchased it lasted me about 10 months so it's a great value. This cleanser works well without being too drying or leaving a residue. It is a good value, as I find I don't need to use a lot. The smell is natural/outdoorsy, but not offensive. I am fine with it, especially since the ingredients are natural. Not really a cream, but kind of a lotion. It cleans nicely and lathers just enought. I like the product. It works well on my sensitive skin. It does leave the skin very soft. 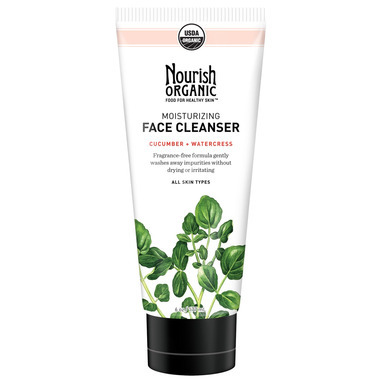 I love how nourishing/gentle this face cleanser is! It also works very well to remove make up and it always keeps my skin feeling fresh and super soft! Had a severe allergic reaction on my eyelids and this product is gentle enough to avoid a similar bad skin reaction. This is the worst cleanser I have ever tried, and the first time I've had to throw out a barely used cleanser. It feels sticky while washing, and leaves a sticky residue once rinsed. It also smells terrible, it literally smells like playdoh. Will never buy anything from this brand again. This face wash is my favourite by far. It leaves your skin feeling so clean without over drying. My skin has never been so clear as when I use this product. The smell is kinda oatmeal-ish, but it is natural so I don't mind. A lot of products with good scents pack chemicals in them so I'll take it. I bought this because the ingredient list is very clean and is perfume free. The smell is not as bad as many people say. The smell is not strong and is very earthy smelling. I like that it cleans well and is natural. Great product! Very good cleanser. Gently clean the skin without drying it out. Like the scent-free formula. Best facial cleanser I have ever used, be it organic or not. I no longer need makeup remover as this does the job perfectly. It leaves my face feeling soft and perfectly clean. Great buy for this price as you don't need a lot to get the job done, and the bottle will last quite a while. I definitely recommend this product and will be buying again and again! This is an excellent organic face wash...very gentle and yet thorough enough to remove the most stubborn makeup. I love it. This is the best face cleaner I have, i'll probably buy an other one after this one. I am very happy with this product! I have combination skin and I find it cleans my oily zone well without drying out the rest of my face. The only (very minor) complaint I have is the smell. I am used to deliciously fragrant products and I find the smell is mild but not the greatest. I still give this 5 stars and would definitely recommend it!